Students are motivated to write with power and passion when they know their words are being heard. Connecting with classrooms provides your students an authentic audience. Kidblog now provides a way to easily locate active classes, similar to yours, right in your class settings. Whether you are brand new to Kidblog, or have been using the platform for years, we now make it possible for you to connect with a variety of classes – classes that we believe are a great fit for you and your students. If you are a brand new user, we share a list of active classes with posts published for the audience Public. 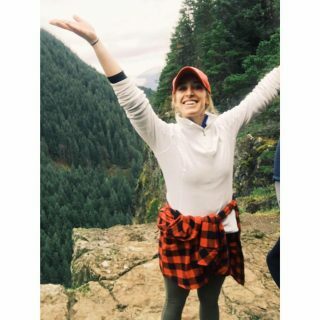 We encourage you to browse these classes for inspiration, and connect so your students continue to build an authentic audience. 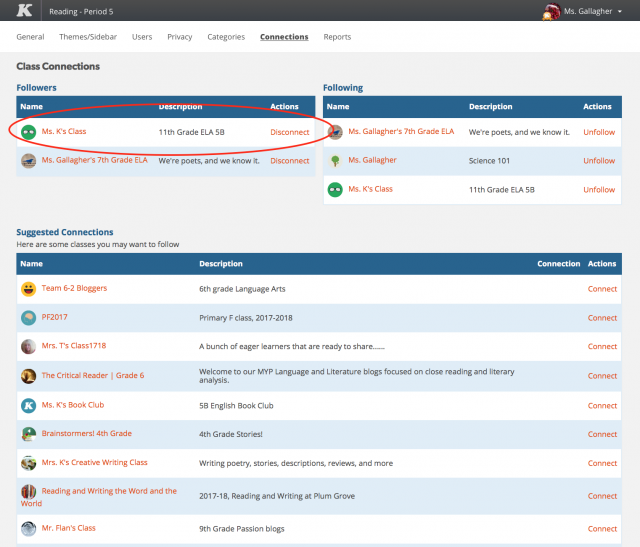 There are two ways to grow your list of suggested connections in Kidblog: Actively publishing for the Public audience and connecting with other Kidblog classes. 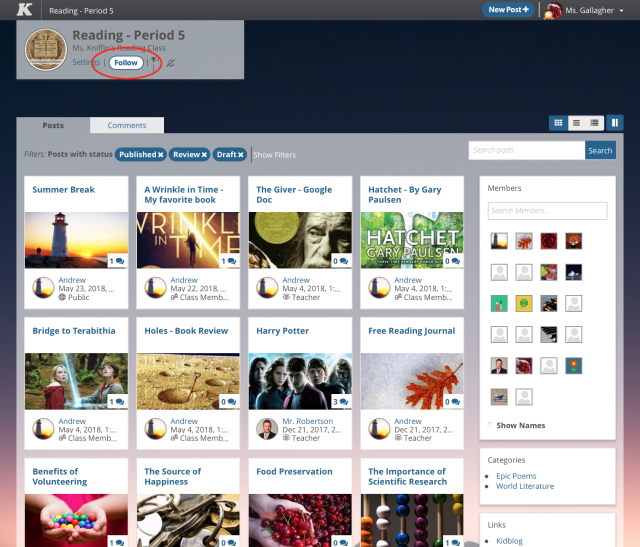 Once your students begin publishing in your class, Kidblog will locate classes that are publishing on similar topics and ideas. These classes will appear on your suggested connections list. Kidblog also takes into consideration second-degree connections. Make a great connection with a class? We will suggest you connect with that class’ existing connections, as well. 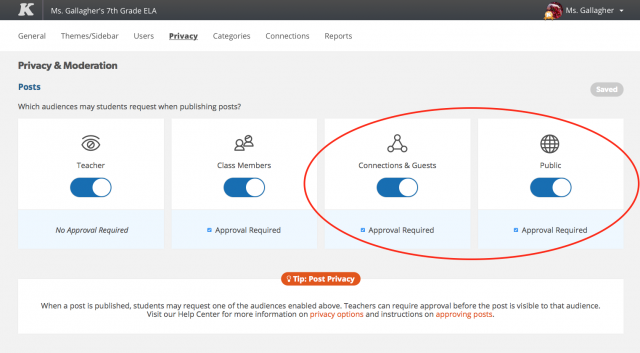 Keep in mind, the more your students publish for the Public audience, the more your class will appear on other classes’ Suggested Connections lists. Visit the URL of another Kidblog class. Then, click the “Follow” button to request access to their posts published for Connections. Send the teacher a quick note to explain who you and your students are and your blogging goals. A follow request will be sent to the teacher. Once accepted, you and your students will be followers of the class. If the teacher requests to follow you back, your two classes will be connected to one another. 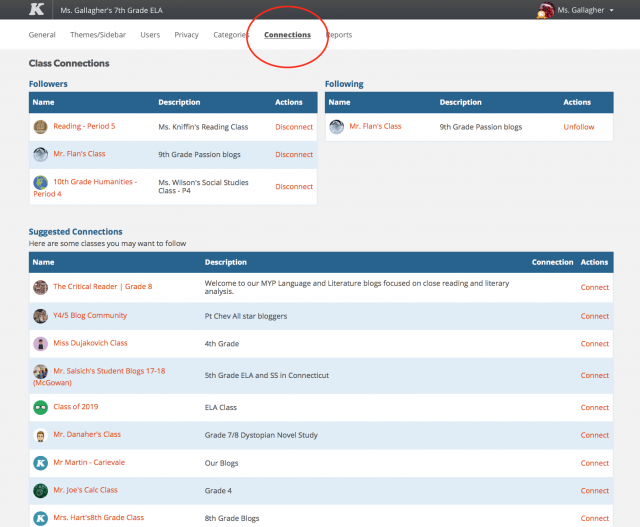 Keep in mind, your connected classrooms are able to view student posts when they are published to either Connections or Public. To allow your students to publish work for these audiences, you will need to set the Post Privacy to include these audiences. For more information of connections functionality in Kidblog, view our Help Center article here. It’s that easy! Questions about the new connections discoverability feature? Leave a comment below and a member of our team will follow up with you shortly.